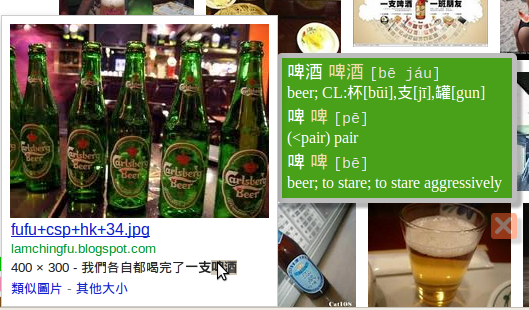 CEDICT is a widely-used Mandarin-English dictionary database. In the mid 2000’s, some members of Cantonese Sheik created a Cantonese version of CEDICT, which was then utilized by CantoFish, a Cantonese-English dictionary plugin for Firefox. In the original Cantonese CEDICT, Cantonese pronunciation and very basic Cantonese usage were added. However, it still lacked Cantonese vocabulary. Later, I was guided to merge data from Cantonese Stardict, which is an electronic version of “A Dictionary of Cantonese Slang”, into Cantonese CEDICT. Now, it is utilized by Cantonese-English Dictionary for Chrome. 1. I corrected all the entries I added from the Cantonese Stardict file, which is from 鴉烏婆 to 丸仔. 2. Classifiers are added to some entries. 3. I corrected errors that were made when others converted pronunciations from Mandarin CEDICT into Cantonese by script. For instance, the pronunciation of 生蛋 was [saang1 daan6*2] in the original. While saang1 daan2 is correct, another combination saang1 daan5 is wrong. Very nice! I was just looking to find a cantonese cedict format version of this. Is it okay if I include it as dictionary data in my cantonese-english dictionary android app? Awesome! Thanks so much for creating this. You’re a hero. Hi, thanks for all the resources on this blog – looks very useful! I just wanted to ask what’s the difference between this file and your Cantonese Stardict File (https://writecantonese8.wordpress.com/2011/03/19/cantonese-stardict-file-fixed/)? Clearly this one is bigger but does it contain all the entries from that file as well? Cantonese CEDICT was created by adding entries from Cantonese Stardict to the dictionary file of Cantofish, which is a Cantonses-lization of CEDICT made by some members from http://www.cantonese.sheik.co.uk. The drawback of Cantofish database is that it is just a Mandarin dictionary with Cantonese pronunciation. Therefore, under the help of a member from Cantonese Sheik, I added Cantonese Stardict into the database of Cantofish. Do you know of a good Cantonese only dictionary? I ask because I want to use one on my phone (specifically with Pleco) and I already have quite a few Mandarin dictionaries (including CEDICT). Yes, you’re right. Cantonese stardict is a Cantonese-only dictionary and the data come from “Dictionary of Cantonese Slang”, which it is a legit Cantonese-English dictionary with a misleading name. http://www.cantonese.sheik.co.uk is the only online Cantonese-English dictionary you can ever find. Therefore, I made an offline electronic Cantonese-English dictionary. I have hard times finding volunteers to create a Cantonese-English dictionary app which has full text search, that is one can type in English and get results. I am absolutely CONFUSED by all the posts on this site. Can someone please explain how to use the .U8 file downloaded here? I don’t get how to import it into ColorDict, GoldenDict or any other Android app. I’ve tried the files listed here: https://writecantonese8.wordpress.com/2011/12/07/cantonese-english-dictionary-for-android/ …and I find the dictionary very lacking in even the most basic, common, introductory Cantonese words. Please, somebody, recommend the best Android app and dictionary combination with which I can use a Cantonese-English dictionary. U8 file – open with notepad like Madedit. It can’t be used in Colordict and Goldendict. This file is for software development purpose. Stardict file – use in Colordict and GoldenDict. I have no control over the content of “Dictionary of Hong Kong Cantonese Slang”. You should use with Cantofish Stardict. Please refer to this post. Hi, I took the liberty of amending the “” file and changed all the accented tone markings to numbers (example, “leung5” instead of “léuhng”) because I noticed Yedict was inconsistent (some entries were accented tones, others were numbered tones). (It’s zipped in 7z compression format). Oops, I mean the “yedict_20100108.u8” file. Hi, I downloaded this file a while ago and I built an iOS app around it. I know it’s a bit late to ask, but would it be alright to use yedict in my app? Hello is there a version which has Chinese definitions instead of English? Thank you. Source: Chinese University of HK website which no longer exists. The extension for Chrome is excellent! Thanks for sharing this resource. Thanks for sharing! I’m re-learning the Cantonese I’ve forgotten, and this is exactly the thing I’ve been looking for. I hope someday Google would buy your dictionary and make Cantonese available on Google translate. By the way, is there a new version upgraded to the latest version of CC CEDICT?